This needs more turmeric. And other phrases I never thought I’d say in my lifetime. Another title I was considering for this article. From minimalist dinners to a pesto that wasn't the greenest, this week offered a range of meals that satisfied a variety of cravings with a healthy dose of reality. You see, we ended up going out on a weeknight! Seriously?! Yes. I'm not joking. So, sit back, relax, have some snacks handy, and settle in for a little tour of dinner. After my birthday weekend came to a close, there wasn't much we were interested in eating because cheesecake will always be life's answer to "how to ruin your appetite for a real meal." And while I loved that gluten free birthday cheesecake with every inch of my soul, it's not the lightest dessert. So by the time hunger found us late on Sunday night, we went for an easy, yet delicious combo: white beans in a simple tomato sauce. Pantry staples cooked together with a few extras and topped with Parmesan. Way more scrumptious than I expected! There was something fairly freeing about making such a quick, no-nonsense dinner on Sunday night. Sure, I still took photos of it and shared it on Insta, but it was a kind reminder that easy meals are a thing to embrace on Sundays. A complicated dinner, or at least one that takes some time, has its place, and sometimes that's on a Sunday, but this time around, quickly heating beans and tomatoes together really hit the spot. A minimalist meal packed with flavor, and protein, for the end-of-weekend win. What's that phrase? The road to hell is paved with good intentions? I think that's it. Basically, that's a version of what happened on Monday. Nothing bad happened, no hell, but you know, we had a comedy of errors (read: Seth had last-minute work travel) which led to a lack of dinner plan, no groceries, and we ended up going out to eat. Astonishing! And a really rare event around here. But surprise surprise, I kind of loved it. My Monday evenings now include a running-based group exercise class which leaves me exhausted and barely functioning. That's an exaggeration. I'm just super hungry when I get home, am absurdly tired, and sometimes cranky. What a peach I must be! Have we discussed my love of nachos? Probably not. I've probably been too shy to admit my adoration for a wonderful plate of piled-high-with-yum nachos. So I got home from the gym and after debating our options briefly, we booked it for the nearest, easiest eatery. That had nachos. Where'd we go? Public Kitchen. A neighborhood spot that has the aforementioned requisite nachos and big TVs to watch sports. A low-key sports bar that has great gluten free options? I’m sold. And although I completed an awesome workout, I decided to throw my hands up and give in to one of my favorite bar foods. How could I resist safely gluten free nachos? I could not. I forgot to take a photo because most of our time at the bar was spent eating in silence (omg I loved the meal), staring at the Sox game, and chatting about the busy day. It’s nice to put phones away during dinner time no matter what - eating at home or out. All in all, we had a great time and it was so satisfying to be out with Seth on a Monday night with no pressure to worry about the post-production aspect. You know, taking photos, editing photos, sharing with all of you. 😉 I love it! But a break is welcome here and there, too. Especially if gluten free nachos are involved. Let’s put this ship back on course, shall we? A regular Tuesday, no surprises, led to a more traditional weeknight with dinner at home after work and the gym. It’s a pattern that works and a routine that fits. I love a good routine as it makes changing things up that much more fun when it happens. However, on this particular Tuesday, I was quite happy that we were settling down to dinner at our own table. My recipe research led me to a new method for basil pesto that sounded delicious and so that’s what we made! I’ve been finding comfort in recipe research online lately as it works well for planning-on-the-go. 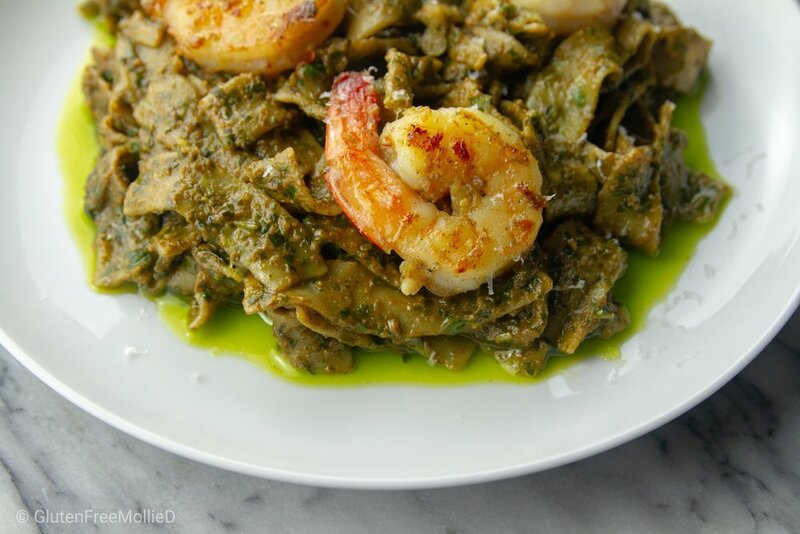 Our basil pesto with sautéed shrimp over gluten free spinach pasta was a delicious dish filled with some of our favorite summer flavors made in a new way. The basil pesto recipe came from Bon Appétit (of course) and was touted as “the best pesto.” While Seth was fairly wary of trying a new pesto recipe, we love his version of this mix-with-pasta classic, he decided to give this new method a whirl. Same ingredients, same process, but it required toasting the pine nuts before adding them to the blender and a bit more olive oil than he typically includes. The result? A great basil pesto that was super-fresh, but not quite as thick and honestly, not quite as green as we had hoped. We decided that toasting the pine nuts didn’t give the pizzazz that was advertised and made the pesto a little less green and more brown when served. I was shocked! I love Seth’s pesto recipe, which I’m not entirely sure he could recite since it’s based mostly on taste and appearance and less on specific measurements. But I’m so glad we tried this one because there are always many iterations of our favorite foods and I think it’s important to try a few, for comparison’s sake. We tried a new brand of GF pasta too, which was made from white bean and brown rice flour, as well as spinach (the kind we chose). It was good! This dinner was delicious, albeit different than our pesto-pasta-shrimp meals of the past, and I think that’s what I’ll remember most. Variations on recipes are terrific and I wouldn’t be against trying even another pesto recipe or GF pasta. It’s easy to get into a vortex of only buying certain brands and only using certain sources, but I think trying new ones is a step forward in (further) expanding my palate and awareness of what else is available. You never know what you’ll find! Next time you need a chic and delicious dish to impress friends and family, but don’t want to work too hard in the kitchen, I’d recommend our Wednesday night dinner. A salad, a protein, and a smile, this dinner was a win all around. And introduced us to even more awesome salad combinations. I had gone for a run after work and was super-pleased with my results which left me quite hungry, so while dinner was being prepped I scoured the cabinets and had my new favorite crunchy snack: Hippeas. Have you had them yet? I love them because they’re GF and taste like a healthier version of Cheetos. They’re made with chickpeas and are actually vegan too, if that’s an important element for your snacks. The Sriracha Sunshine Flavor is yummy as well as the Vegan White Cheddar. Highly recommend grabbing a bag or two next time you’re shopping! Back to dinner! We had a fantastic Cucumber and Melon Salad with Chile and Honey and paired it with turmeric-paprika grilled chicken. The salad was excellent, but we definitely needed something on the side. Chicken to the rescue. Salad-wise, we just loved this fruit-and-veggie combo that had so many great surprises: spicy hot peppers, salty pistachios, a mild, but perfectly suited dressing, and nice slabs of ricotta salata for an awesome cheese element in every bite! I don’t know about you, but I love making sure every ingredient is on my fork when I eat salads to make sure I get the exact flavor of what has been created. It’s kind of messy at times, but I find it’s the best way for me to decide how much I love a dish and what about it I love. All flavors together! I’m not always the biggest cantaloupe fan, but put it with cucumbers and spicy flavors and cheese? Wow. It’s fantastic. My worries about this salad not being “good enough” were swept away immediately. I should have known, though, because it’s another winner by Claire Saffitz. Her. Recipes. Rock. While it took me longer than it should have to embrace eating tomatoes on their own, now that I’m used to it and actually enjoy the concept, I just can’t stop! I add tomatoes regularly to my morning eggs and we often use them in any number of dinners, but a recipe/meal focused primarily on the iconic summer item? Whoah. How would that go? Turns out, it was a hit! Selecting a recipe to feature the bounty of tomatoes available at Wilson Farm was pretty much a no-brainer: Caprese Salad! Something with simple ingredients and minimal prep would be the best way to showcase their incredible selection. We found an easy option online, via Bon Appétit, which was aptly titled, “Ultimate Caprese Salad,” and ultimate it would be! Covering a giant platter with many pounds of tomatoes, fresh mozzarella and basil, then drizzling with olive oil, couldn’t have been easier! A terrific option for a weeknight side dish, a weekend outdoor party, or just a really splendid snack, this Caprese was poised for success. The “hardest” part was waiting a little over thirty minutes once it was arranged to let all the juices meld and for the whole thing to relax (read: become even more awesome). Once we were done waiting, I eagerly spooned a giant section of it onto my plate and dug in - used my knife and fork and cut each piece up - and was thrilled! The tomatoes were bright, juicy, and tasted like late-summer and the pops of mozzarella and basil were perfect flavors and textures to balance out all of that tomato. Yes, I do love tomatoes way more than I used to, but I’m still a little particular. I love grape tomatoes the most because they’re small and easily “pop-able” as a snack. The larger slices of tomatoes I enjoyed as long as I topped them with the other ingredients and a sprinkle of sea salt. Aside from a salad like this one, I love sliced tomatoes on top of burgers or chopped up amidst another, busier dish. Once the weekend arrived, we tossed aside the pots and pans and went out! Friday night brought us to Somerville where we had dinner with Seth’s family at Mastra on Elm, a Tibetan restaurant that joyfully had plenty of gluten free menu items. I had a delicious rice-based appetizer, followed by a great tofu and pineapple curry served with brown rice. I even sampled Seth’s dinner that had a spicy garlic sauce (also GF) and that was really yummy, too. Despite having seen this restaurant in Davis Square for many years, it was only this weekend that we finally visited. And I’m glad we did! We’ll definitely be back to try even more of the flavorful entrees and shareable appetizers. Beautiful weather finally graced the northeast so we took advantage the rest of the weekend and headed north to Maine! A brief twenty-four hours, but it was filled with a few of my favorite activities and foods in Ogunquit: long walks around town, along the Marginal Way, and through Perkins Cove, bun-less hotdogs and vacation-mindset pina coladas at Barnacle Billy’s, easy GF nachos at Beachfire Bar and Grille, and then closing out the quick visit with a yummy GF breakfast sandwich at Backyard Coffeehouse and Eatery. The best part of our Maine trips (even the quick ones) is that we often do the same activities, but in a varying order each time. 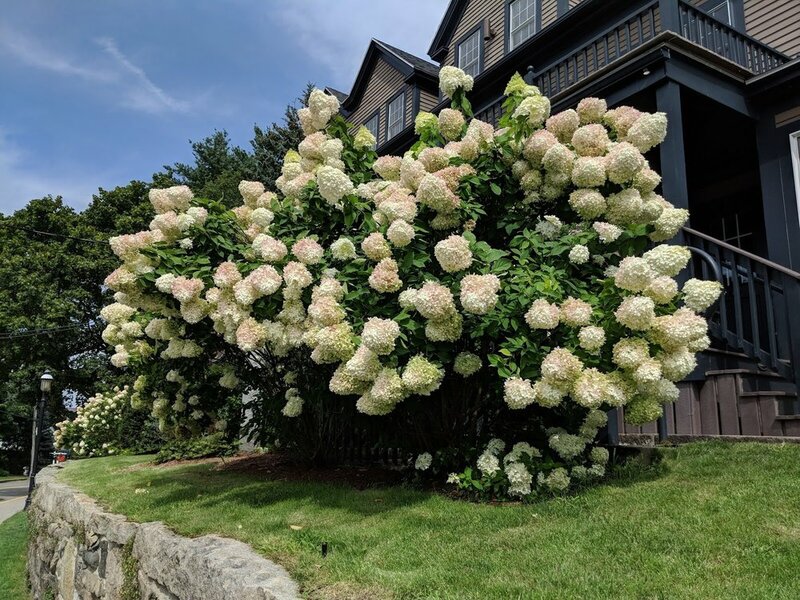 Sure, I’ve mentioned these same restaurants multiple times throughout the summer on other Recaps, but since the season is so short and we only visit so many times, I’m a sucker for tradition and getting my “fill” of these summer staples in Maine. We hope you had a wonderful summer weekend and are looking forward to a change in seasons (fairly) soon! White Beans in Red Sauce and Parmesan: No formal recipe for this one, but it’s naturally gluten free. We used white beans from Jovial Foods and fresh tomatoes from our balcony garden. Season to taste with salt, pepper, and shaved Parmesan! 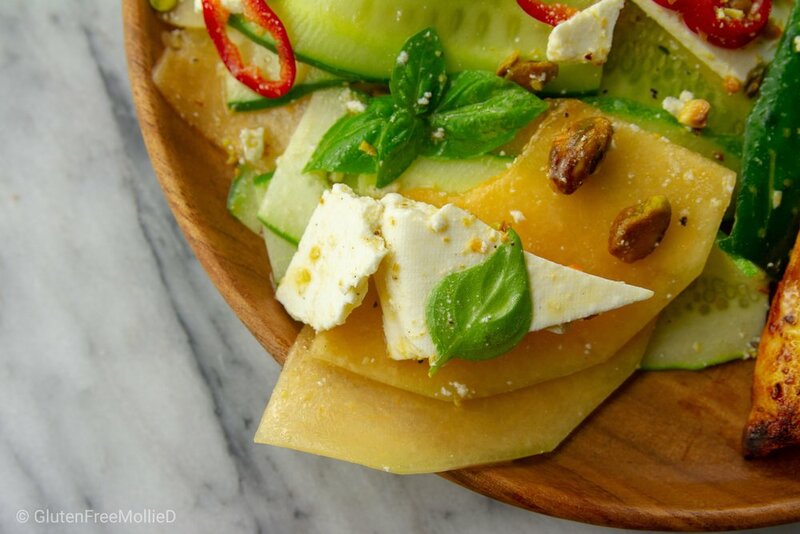 Cucumber and Melon Salad with Chile and Honey, Turmeric-Paprika Chicken: Recipe for salad by Claire Saffitz and is available here! For the chicken, Seth created a quick marinade with turmeric, paprika, olive oil and other spices. This entire meal was naturally gluten free. Basil Pesto Pasta with Sautéed Shrimp: Recipe for pesto is by Andy Baraghani and is available here! The shrimp, no recipe, were sautéed in butter, garlic, and shallots. We used gluten free pasta from the Al Dente Pasta Co. Ultimate Caprese Salad: Recipe by Rick Martinez and is available online through Bon Appétit, here! We followed it as written, but maybe used a little extra salt and pepper. ;) It’s a naturally gluten free dish.